If you are looking for a used Hyundai Santa Fe in North Bay, Ontario, Sudbury and surrounding area, the Kia of North Bay sales team will be able to satisfy your needs. Kia of North Bay often has a great selection of pre-owned Hyundai Santa Fe in stock and add to the vehicle inventory daily. At Kia of North Bay we proudly sell and service used Hyundai Santa Fe to customers from North Bay, Ontario, Sudbury, Huntsville, Temiskaming Shores, Nipissing, Timmins, Mattawa, Blind River, Pembroke, Parry Sound and surrounding areas. 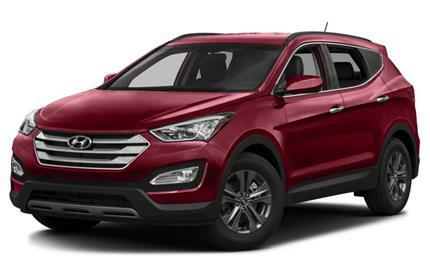 The Hyundai Santa Fe Sport is a stylish crossover vehicle. Buyers will appreciate the utility, safety, and refinement of this vehicle. The Santa Fe Sport provides seating for five and can be ordered with front- or all-wheel drive. A 190-hp 2.4-liter four cylinder engine, or a 264-hp 2.0-liter turbocharged four cylinder sends power to the wheels through a six-speed automatic transmission with SHIFTRONIC. Standard safety features include seven airbags, anti-lock brakes with brake assist, electronic stability control with traction control, and a tire pressure monitoring system. Available features include Blue Link telematics, 19-inch alloy wheels, power heated and ventilated leather seats, heated steering wheel, navigation system, and a panoramic sunroof. For 2015, passenger window auto/up down has been added as standard, the base Sport adds a driver side blind spot mirror and heated mirrors, and the power liftgate is now has smart hands-free convenience and is standard on the Sport 2.0T. Source: Chrome Data.